If you’re on the hunt for something summer-y, refreshing and simple, search no more! This lemon icebox pie is a keeper — it’s satisfying, easy, and calls for very few ingredients and minimal equipment. The original version is from Cook’s Country, and what’s interesting about it is instead of sweetening the whipped cream topping with sugar, you reserve some of the condensed milk and whip the condensed milk with the cream. It gives the whipped cream topping a little more body and flavor, plus it’s a clever way to consolidate ingredients. I served the pie after chilling for only 3 hours and it sliced okay, but it made a much better presentation on Day 2, so I recommend making this one a day ahead. 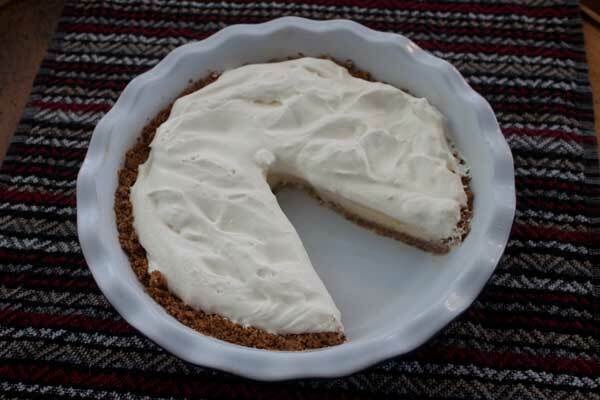 This Lemon Icebox Pie is easy and refreshing. It can be made as directed, but if you don't need as much pie you can make the filling with 1 can of condensed milk 1 1/2 egg yolks and 3 1/2 ounces of filling juice. Keep the topping amount the same. Put the graham crackers in a heavy duty zipper bag and crush with a rolling pin. Mix crushed crackers, sugar and butter together in a bowl, then press tightly into bottom and up the sides of a 9 inch pie plate -- I used a deep dish. Bake on center rack for about 12 to 14 minutes. Let cool for 30 minutes. Open the condensed milk and measure out 3 generous tablespoons. Set aside. Pour the remaining condensed milk into a mixing bowl and whisk in the egg yolks. Gradually whisk in the lemon juice. Pour mixture into the pie crust. Increase the oven temperature to 375 and bake pie for another 15 minutes. Let cool at room temperature for 1 hour, then chill for at least 3 hours or preferably overnight for a firmer pie. With an electric mixer, beat the reserved 3 tablespoons of condensed milk and whipping cream until thick enough to spread, then beat in the vanilla. Spread over the top of the cooled pie and serve immediately or refrigerate until ready to serve. Thanks for the report! I’m so glad the recipe helped make your Father’s Day a success. I ended up making Todd one of those icebox cakes with chocolate wafers and whipped cream. That’s his favorite even though it’s incredibly simple. He liked the lemon pie too, though. I made this for Father’s Day dessert, and got raves from everyone who tasted it. Definitely a keeper recipe, and I will be making it again soon to share with my Facebook friends who are all clamoring for a piece. 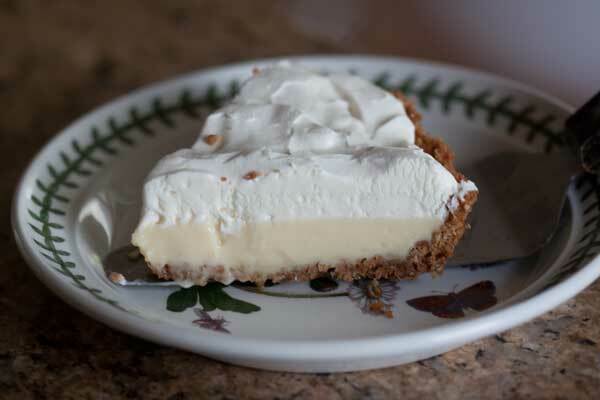 I was thinking of making Randy’s Key Lime Pie after a friend had one shipped from Florida for their birthday celebration. But, this recipe looks just as delicious, easy, and refreshing. Hmmmmm. Decisions, decisions. Btw, Anna, I hope your new neighbors know how fortunate they are to have you move to their neighborhood. Hope you and your family are getting settled in your new home. I’ve never tried using the condensed milk with whipping cream. I just got some lemons and am going to be trying this pie this weekend. Thanks for the wonderful sounding recipe. Looks delicious and perfect for summer! !